Water levels in overflowed creeks are slowly starting to decline on the Pine Ridge Reservation. "What used to be a dry creek is now a swelling, raging river," said Peri Pourier, South Dakota state representative for the district that includes Pine Ridge. The freshman representative has been coordinating relief efforts for the community, where many residents were cut off by flooded roadways. "There are community and tribe members getting on horseback to reach people and get them supplies," Pourier told NPR. Henry Red Cloud, a resident of the reservation, lives beside what was once a dry creek bed. He spoke to NPR as he oversaw the rescue of his dog, Chief, from his home's front porch. "Currently we're in waders and there's a gentleman here to help me save the dog," he said. The 60-year-old Oglala Sioux Tribe member was born and raised on the Pine Ridge Reservation. "It's usually dry here — we never get this kind of flooding," he said. "It's like a 100-year flood." Some residents have spent nearly two weeks stranded in their homes, and some have alluded to a slow response from state and federal assistance, according to The New York Times. On the 13th day of flooding, Pourier said she is not sure why it took until the weekend for South Dakota Gov. Kristi Noem to deploy National Guard soldiers to the reservation. "I know that requests [for assistance] were made early on," Pourier said. But Noem, who visited the reservation on Saturday, told The New York Times that she approved formal requests for assistance soon after the Oglala Sioux Tribe, which administers the reservation, made them. 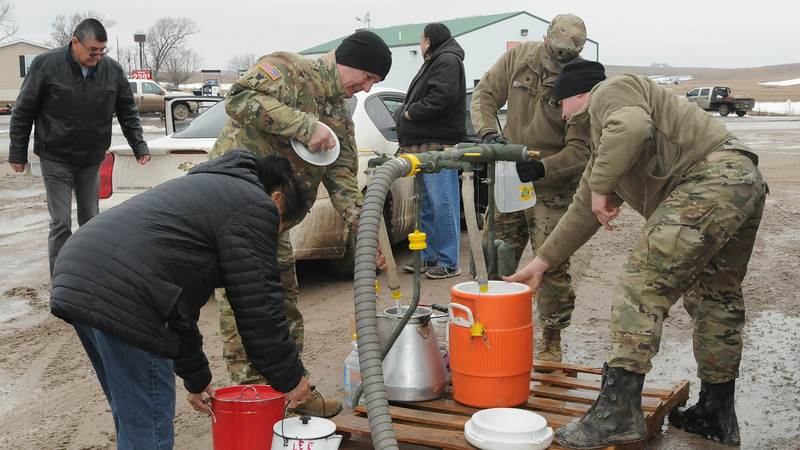 By the weekend, Pourier confirmed, the state had deployed several teams, such as a water rescue team, and the South Dakota National Guard to distribute potable water. "We were in Pine Ridge within 24 hours of our deployment," said Lt. Col. Anthony Deiss, a spokesperson for the South Dakota National Guard. "We were already preparing so that we could move very quickly, and our unit traveled from Watertown, which is eight hours away" from the reservation, Deiss told NPR. A blizzard followed by rapid snowmelt caused fast-rising waters on the reservation, jeopardizing nearby dams and overflowing creeks and rivers. Pine Ridge community members are not the only ones affected in the central U.S., as historic floods down the Missouri River breached levees and submerged towns through Nebraska, Iowa and Missouri over the past 10 days. But for residents of Pine Ridge, the flooding has taken what was already a dire situation and made it "devastating," Pourier said. "We're already underfunded and strapped for resources" from the Bureau of Indian Affairs, she explained. "We're already in survival mode every day." Red Cloud also pointed to the situation being exacerbated by deteriorating infrastructure and a lack of support from the federal government. "If we had funding to fix our waterways, our infrastructure here; our dams have been built like 80 years ago — they're outdated," he explained. "If funding was set in place we wouldn't be in the predicament that we are now." "Things are hard and have been hard here for generations," Red Cloud added. "People are devastated," Pourier said. She said that, for now, water levels seem to be stabilizing and declining on Pine Ridge, but as the region warms up through midweek — temperatures are expected near 70 degrees in Pine Ridge on Tuesday — officials are bracing for the potential of more flooding. "We still have snow that hasn't melted that could melt," Pourier said.